Since making his Major League debut on April 17, D-backs right-hander Josh Collmenter has looked good in relief. He will now get a chance to continue his strong pitching as a starter. D-backs manager Kirk Gibson tabbed Collmenter to start Saturday’s game against the Dodgers in Los Angeles. He will be opposed on the mound by Dodgers right-hander Chad Billingsley, who is 2-2 with a 3.91 ERA in this season. In seven appearances with the big league club, Collmenter has thrown 14 innings with a 1.29 ERA, 11 strikeouts and just one walk. Collmenter has surrendered just eight hits, and two earned runs as a reliever. Those runs came in his April 24 outing against the Mets. Otherwise, he has held opponents scoreless in his other six outings. The right-hander began the 2011 season at Triple-A Reno where he made one start. In that game, Collmenter allowed just two hits and one earned run in six innings to earn the win. 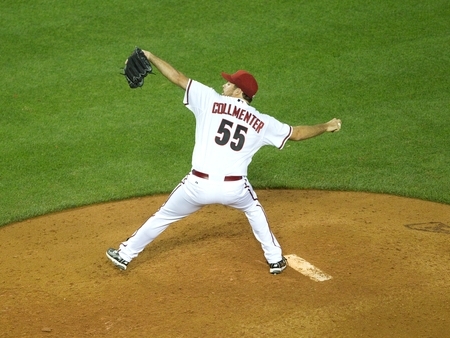 While he’s been a reliever during his short stint with the D-backs, Collmenter is not short on starting experience. Collmenter was a 15th round draft pick by the D-backs in the 2007 amateur draft. Throughout his five seasons in the D-backs’ minor league system, he has notched 41 wins with a 3.50 ERA. He made 94 appearances, with 92 coming as a starter. In 515 innings pitched, Collmenter fanned 472 opposing batters to average 8.2 strikeouts per nine innings. Collmenter pitches with a unique delivery, throwing directly over the top. He boasts a solid fastball and an excellent changeup to go with a developing curveball. Collmenter takes the place of Barry Enright in the D-backs’ starting rotation. Enright was optioned to Triple-A Reno last week after posting a 6.49 ERA in six starts this season. This weekend’s series marks the first time the D-backs and Dodgers will face off in 2011. Saturday’s matchup is slated to begin at 4:10 p.m. The Dodgers’ first games at Chase Field won’t happen until after the All-Star Game, July 15-17.